Had to work a little harder today – got stopped out twice but made it out ahead. Nice. In case you didn’t catch it, put out a video on Trading Gold and Silver over the weekend . Not my usual shtick. But boy, what a response! I certainly hit a nerve with the “Gold bugs”. Again thank you for all the birthday wishes – I don’t deserve them. But the winning trades and the winning traders really makes my day – thank you, keep them coming. 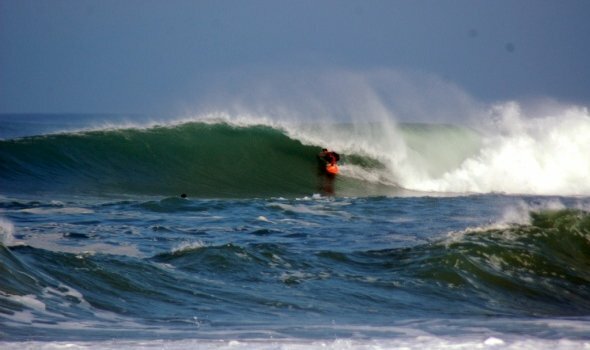 Lastly, just a couple of photos from Hossegor surf on Friday and Sunday. The swell was 6ft on Friday and then backed off a little with fantastic weather and light offshores. Let’s hope it keeps going for the Quiksilver Pro starting in a week. Pictures courtesy of MagicSeaweed.